third Melbourne-born player after Andrew Bogut and Kyrie Irving to be selected with the first overall pick in the NBA draft. 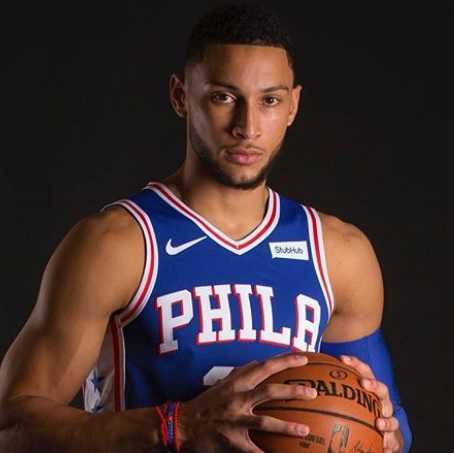 Benjamin David Simmons, popularly known as Ben Simmons is an Australian professional basketball player who currently plays for the Philadelphia 76ers of the National Basketball Association (NBA), selected with the first overall pick in the 2016 NBA draft. He mostly plays in Point guard position and wears shirt number 25. He is the third Melbourne player after Andrew Bogut and Kyrie Irving, to be picked in NBA draft. He was named the 2018 NBA Rookie of the Year. American model and tv personality Kendall Jenner has hinted that she has reunited with the Australian Ben Simmons. She was noticed cheering her former boyfriend from the sideline in the Philadelphia 76ers match against the Cleveland Cavaliers. Tristan Thompsons of Cavaliers taunted Simmons during a free throw, as Simmons responded with a middle finger. Jenner booed and laughed during the throw out of a fun. They two were separated from each other in the fourth quarter of the game. However, 76ers suffered their first home loss in 20 games at home. They were defeated 121-112 in a tough match by the Cavaliers. At the end of the game, Kendall congratulated the Thompson and gave him a warm hug. Thompson is the boyfriend of Jenner's sister, Khloe Kardashian. They have a daughter together, True Thompson. However, they two are in an on-off relationship with each other. He was named 2018 NBA Rookie of the Year. He is the third Melbourne-born player after Andrew Bogut and Kyrie Irving to be selected with the first overall pick in the NBA draft. Ben Simmons was born on 20 July 1996. His birthplace is in Melbourne, Victoria in Australia. He was born to American father Dave Simmons and Australian mother Julie. She has a sister named Olivia. His mother had four children, Melissa, Emily, Liam, and Sean with her previous husband. His father also played professional basketball for Melbourne Tigers in Australia's National Basketball League. He holds both Australian and American nationality. Simmons grew up in Newcastle, New South Wales, where his father played and coached basketball. Simmons started playing at the age of seven joining Newcastle Hunters' U12 team. He also played for Lake Macquarie and Newcastle there. He also played junior rugby in the local league and Australian rules football. He later chose to focus on basketball. Simmons attended Montverde Academy in Montverde, Florida in the US and played for Montverde Academy. He helped Montverde to win three High School National Tournament. He was named America's top high school junior and MVP at the National Basketball Players' Association Top 100 camp for his performance in 2013-14 junior season. He was also named 2015 Morgan Wootten Award winner for his outstanding performance in the 38th annual McDonald's All-American Game. He was also named the Naismith Prep Player of the Year and Gatorade National Player of the Year in March 2011. He played for the World Team that defeated Team USA in the 2015 Nike Hoop Summit. ESPN.com listed him as the number one power forward and the number one player in the nation in 2015. Simmons joined Louisiana State University and started playing for LSU Tigers men's basketball team. Following his performance for the LSU Tigers in the preseason, he was named SEC's Preseason Player of the Year and was featured on the Blue Ribbon College Basketball Yearbook 35th anniversary cover. He also earned Associated Press preseason All-America team honors. LSU Tigers played below average performances throughout his career in college. He withdrew from the college after declaring for the 2016 NBA draft. 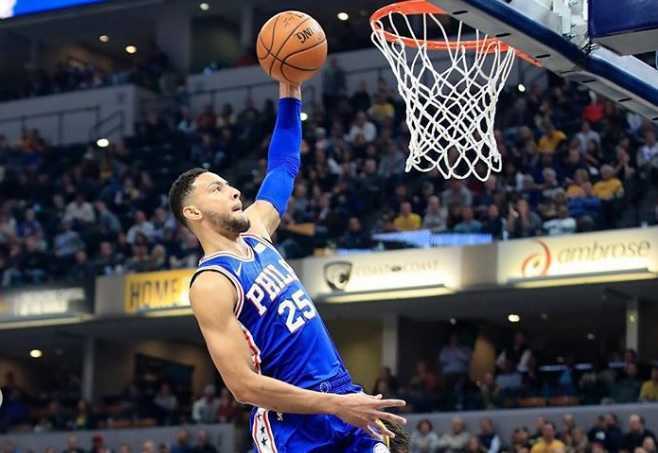 Philadephia 76ers selected Simmons with the number one overall pick in the 2016 draft, making him the third Melbourne-born number one overall pick in 11 years. Two others Melbourne-born overall picks were Andrew Bogut in 2005 and Kyrie Irving in 2011. He also became the first college player in the modern era to be selected with the first overall pick without playing the NCAA Tournament. He was named in the All-Las Vegas Summer League First Team in 2016. He was ruled out for the entire 2016-17 season after suffering the right ankle injury in September 2016. He made his NBA debut in October 2017 against Washington Wizards. For his overall performance, he won three consecutive, four in total Eastern Conference Rookie of the Month during the 2017-18 season, ultimately being named the NBA Rookie of the Year. He also earned NBA All-Rookie First Team honors for the 2017-18 season. At the age of 15, Simmons represented his birth-nation Australia at the 2012 FIBA U17 World Championships. He helped Australia U17 to secure a place in the final against the United States. The USA defeated them in the final. Simmons made his senior debut for Australia in the 2013 FIBA Oceania Championships against New Zealand, eventually winning the gold medal for the team. Simmons will represent Australia at the 2020 Summer Olympics in Japan. Simmons was previously linked with American singer, songwriter, dancer, and actress Tinashe. Currently, he is in an on-off relationship with American model and television personality, Kendall Jenner. Ben Simmons stands 2.08m ie six feet ten inches tall. His height has given him a great advantage in the basketball court. He has a body weight of 230lb ie 104 kg. He has an athletic body build and has maintained his body perfectly fit. As of 2018, the net worth of Ben Simmons is estimated at around $75 million. He has an endorsement deal with Nike. He has earned quite a fortune after being picked up in 2016 NBA draft by Philadelphia 76ers. He has reportedly earned $12,0000000 over two seasons at Philadelphia. Simmons became the first college player in the modern era to be selected with the first overall pick without playing the NCAA Tournament. Simmons was featured in the One & Done, the Showtime documentary film in November 2016.